Tru here. 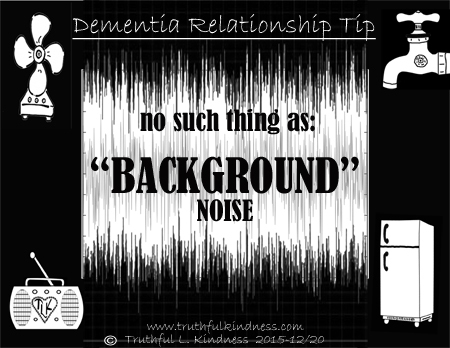 Single gift that you could give for greatest impact in my current moments with you would be to understand this fact: For me, there is no such thing as BACKGROUND noise. My brain seems to have lost ability to prioritize audio signals. It is like my sensitivity sensors are turned up, so even if volume is so low that I am only picking up few of the sounds, it is enough that my attention is distracted, trying to figure out those sounds. 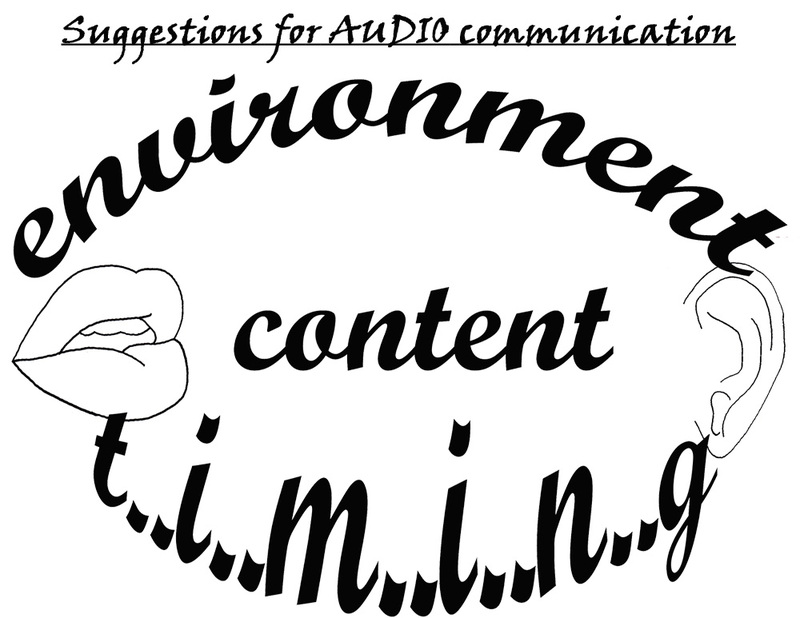 So even tho the sound (of fridge fan, range fan, water running for sink, or the dishwasher) is so low in volume that it is un-noticeable “background” blur to YOUR brain, my brain includes these low-volume sounds in the pile of audio puzzle pieces when trying to follow your conversation. Then add my constant tinnitus to those sounds. TV/Radio or multiple conversations at the same table is even more of a problem, even if the volume is very low. My THEORY on this reasoning is that since all audio signals are now scrambled, the low volume tones are just as crucial as high volume tones, in order to construct puzzle of words being heard. Since my hearing is considered normal … for an 85 year-old woman (and I am 58years old), I sometimes wear my sophisticated hearing aids. I usually leave these hearing aids in the “directional” setting, where I will hear sounds from whichever way my head is facing with higher volume than sounds coming from other directions. With extreme concentration added, the directional hearing aids might make the difference for success in picking out basics of a conversation (from the low murmur of surrounding sounds) for short time periods, but even the directional hearing aids don’t seem to make much difference in my stress level. Suspect that what I call this lack of audio signal prioritization largely contributes to confusion and over-stimulation in public spaces. An example might be in medium-sized parking lot this week; my notes say that I was walking in back of parked car, but did not notice motor starting or back up lights. There was no other motor in the close vicinity, but even with the louder volume right beside me, I did not notice when the vehicle started their engine. Thus I was quite startled when they began to back up. Husband said I should hit the back of their car with my walking canes next time ((grin)). Another example from this week was when grandsons were playing quietly in one corner of room and husband turned on iPad to show daughter a short video (lo volume) in the other side of room … Everyone was trying to accommodate to my needs by keeping volume low, and I wasn’t angry, but still I needed to leave and find a quiet place for a while. Sound disorientation of different types is a very big problem for me and the majority of my friends with dementia symptoms. In order to maximize conversations and relationships, it would be really great if confusion from sound sensitivity was better understood by those trying to hold conversations with us. * Admin issues: SHARE dementia awareness thru buttons below. Feel free to leave your thoughts in the form of comments, but please filter your comments with truthful loving kindness to all concerned. If interested in receiving notice of future blog postings, subscriptions are available through a “follow” button in the upper left corner (MS Explorer) or lower right (Safari, Mozilla Firefox and Chrome). If there is an advertisement below, I have no control over what is shown. My own full legal name is Truthful Loving Kindness. My current clinical diagnosis is Mild Cognitive Impairment. Text for this page took 5hrs over span of 4 days. Graphic took 2.5hrs. Copyright 2015-12/22. This entry was posted in Communication, Crucial, Important, Relationships, Symptoms and tagged noise, sound, symptoms. Bookmark the permalink. Would love to include a couple applicable links from your blog on bottom of this, but cannot find them.